Home / ONGC Recruitment / Recruitment / Apply ONGC Recruitment 2017–18 of 27 Executive Online Now! Apply ONGC Recruitment 2017–18 of 27 Executive Online Now! ONGC Recruitment 2017: Oil and Natural Gas Corporation Limited has providing a chance to passionate and enthusiastic candidates in their department. Interested candidates are advised to apply for ONGC Recruitment 2017–18, as there are about 27 Executive vacancies is available in their department. Candidates can grab the whole ONGC Notification through online mode by going through this page. Candidates who are going register themselves for ONGC Recruitment, are informed to comprehend the notification carefully which are presented in the provided job link on this page. To get recruited in Oil and Natural Gas Corporation Limited, contenders have to go through the phases of ONGC Online selection procedure such as UGC NET etc . To apply for ONGC Executive Recruitment, you are needed to fill the application form and submit it before the last date. For Human Resource Executive: For ONGC HR Executive Recruitment, you must have done MBA with specialization in Personnel Management / HRD / HRM OR have done Post Graduate degree in Personnel Management/ IR/ Labour Welfare OR Minimum 2 years full time Post Graduate Diploma in PM/IR/Labour Welfare. For Finance and Accounts Officer: For ONGC FAO Recruitment, you should have a specialization in MBA with Finance with minimum 60% Marks. For Official Language Officer: Interested applicants to hire for their position must have done Post Graduate in Hindi and should have English as a subject in graduation. Experience in translation work preferred for all categories. How to get Selected for ONGC Jobs? If you want to get ONGC E1 level Post’s, then you have been selected according to the University Grant Commission-National Eligibility Test (UGC NET) conducted by Central Board Of Secondary Education. After getting qualified in UGC NET- 2017 Examination, you have appeared in the personal interview. To grab this opportunity, you are required to fill the application form and for this, we are presenting some beneficial steps, by which you can easily fill the required form and submitted the same. Now, applicants need to fill the registration form of UGC NET-2017 with complete details. When the registration process of UGC NET-2017 is completed and applicants need to take a print out of the registration slip. You have to hit appropriate link for the above said posts. Finally after all process is done hit on submit tab. Also take the hard copy of application form and keep it safe for future use. 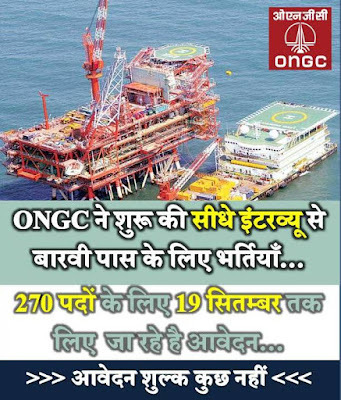 What Pay I Get From ONGC? Those who are get hired for Oil and Natural Gas Corporation Limited Vacancies, they will get exclusive amount of pay scale that is Rs. 24900 to Rs. 50500/- with an increment of 3% per year. Besides this, you will also get the other allowance @ 47% of Basic Pay under Cafeteria Approach, Dearness Allowance, HRA/Company Accommodation and Mining Allowance etc as per Company rules. You can directly get all the information about ONGC Recruitment, by selecting the link which is provided on this page. Candidates may also give their suggestions and take query regarding ONGC Recruitment Notification by writing in the comment box stated below. You can also subscribe us for attaining the information directly to your mail box. Thank you!! I am unable to submit my online application form for the ONGC Mumbai Recruitment. Can you please send me the direct link to do the same.